Birchbox sent me an email announcing their Birchbox at Selfridges Beauty Box. It costs £20 for items valued at £69, but you have to put your name down on the waiting list, and there is no hint at what there will be as yet. Currently Birchbox are doing a tour of Selfridge stores where you can build your own box for £15 including items from bands such as Laura Mercier, Eve Lom, and Bioderma. The next store at the time of writing is Manchester Trafford on Sunday, 20 March until 9 April. This could be worth it if you are nearby, as you can pick your own 5 products. A couple of magazines have some free on the cover beauty treats this month. 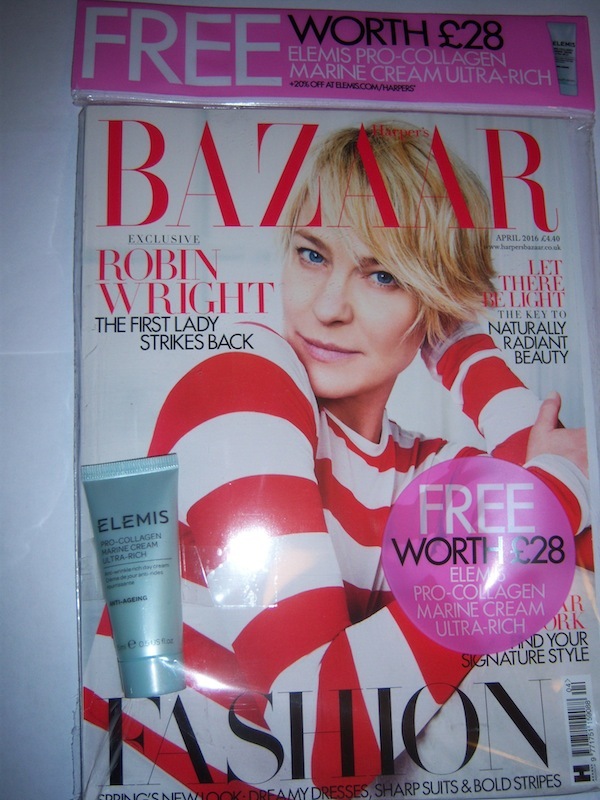 Harper Bazaar has a 15ml tube of Elemis Pro-Collagen Marine Cream Ultra Rich worth £28. Visit http://www.elemis.com/harpers for a 20% discount until April 10th with some exclusions. The face mask is the best value and most useful product for me, and is worth the £2 for the magazine. Use the code 20GLAMOUR for a 20% discount on the Balance Me website. The Glamour Spring Edit Box is still available for £17.99 (plus £3.95 postage) from Latest in Beauty with a retail value of £79.65. This is good value if you like llamasqua’s Precision Ink in Abyss liquid eyeliner, as it’s the only full size item worth £20.50. Other items of note are: MALIN+GOETZ Vitamin E Face Moisturizer (40 ml) and Murad AHA/BHA Exfoliating Cleanser (30 ml) which are special sizes and a £10 voucher to use at the Murad website. All the other items are sample sizes, and with so many boxes to choose from, good value ones aren’t based on retail value, but whether you will use all of the items.